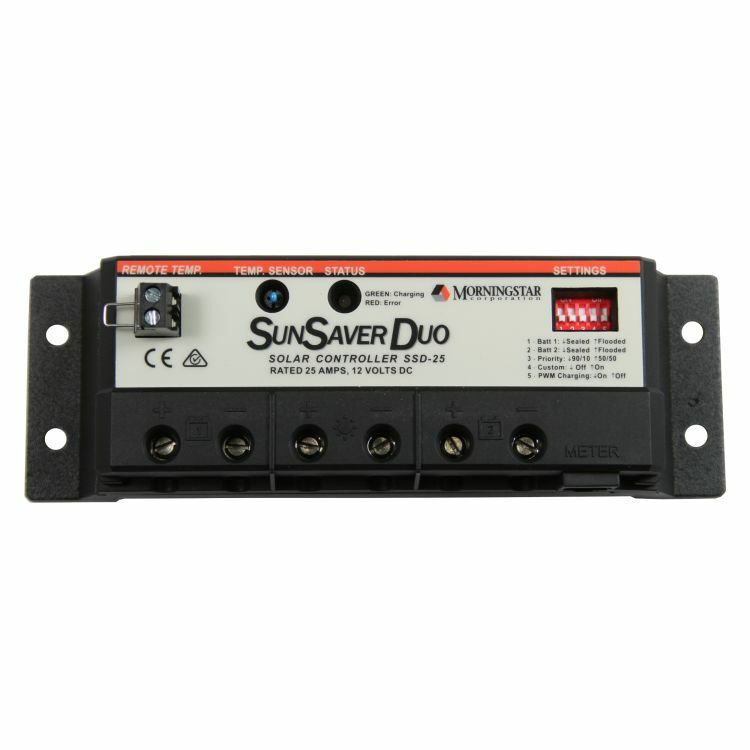 MorningStar two battery solar controller with temperature sensor and remote digital meter. This Kit is Ideal for any battery system that has two independent battery banks, or two batteries that are used for different purposes. The SunSaver Duo will independently charge both house and engine batteries, with priority user setable. Choose between a 50/50, and a 90/10 split in charging value. This feature is easily programable by the end user, and can be easily switched. 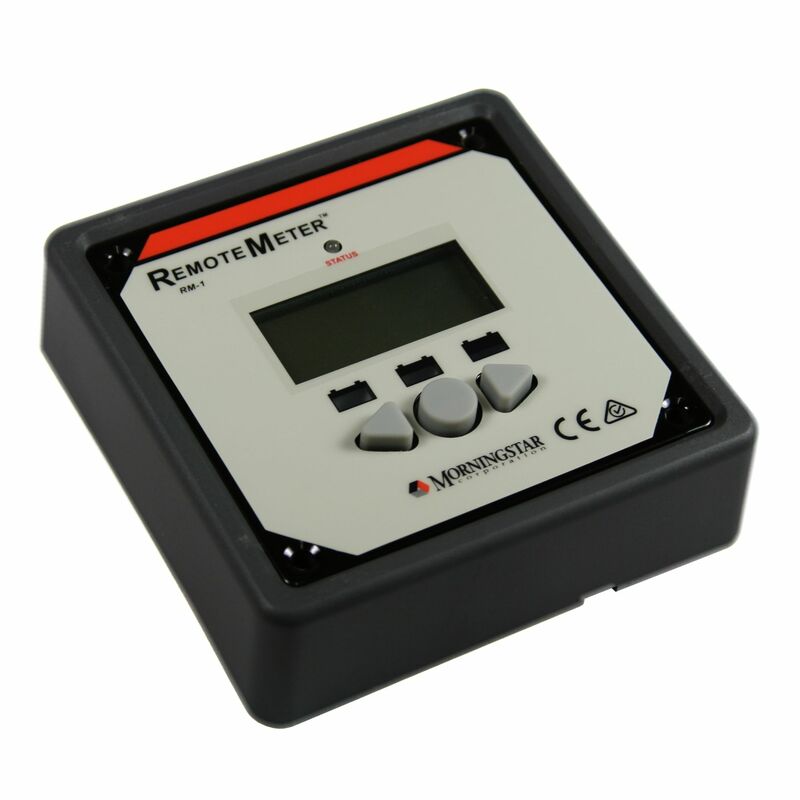 The included digital remote meter displays digitial and pictoral system information, including state of charge, ambient temperature at controller, and available solar power in amps. Digital display is backlit for easy viewing. Will work on panel systems up to 25 amps. • TWO BATTERY SYSTEM CHARGING Solar charge current is shared between the two batteries based on a user selectable priority. • LONGER BATTERY LIFE Four stage series PWM pulse charging and temperature compensation increases the useful life of the batteries being charged. • EXTENSIVE ELECTONIC PROTECTION The controller will not be damaged by wiring mistakes made during installation. There are no fuses to replace, and the controller will automatically reset in the event of a wiring error. 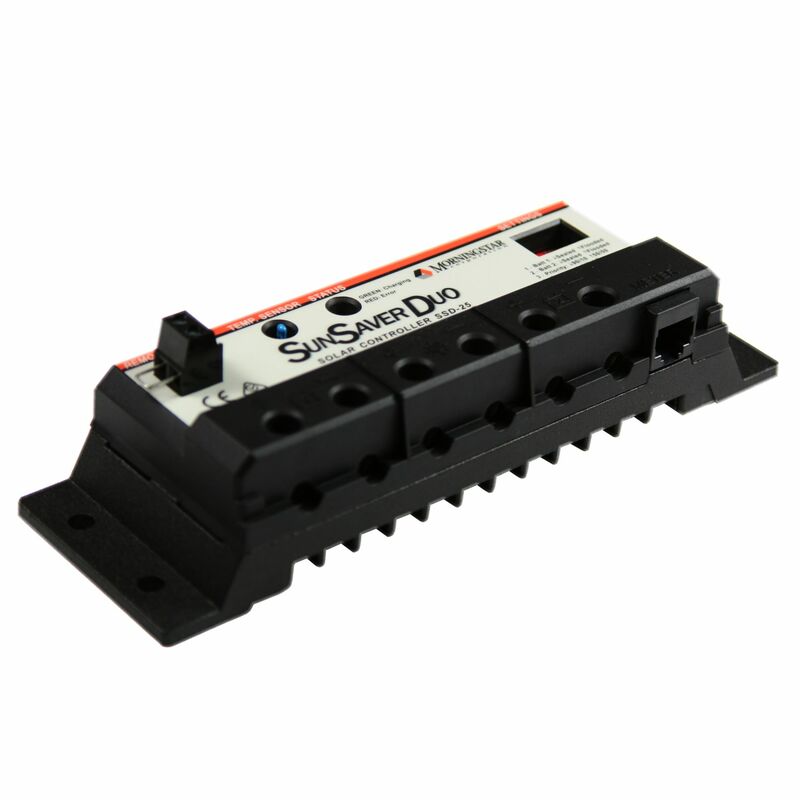 • HIGHLY RELIABLE Epoxy encapsulation protects sthe controller against dust and high humidity. Efficient electronics and a conservative thermal design allow the ocntroller to operate reliably at higher temperatures. This all inclusive package is everything you need between your solar panel and your battery. Even includes mounting screws! *Flat Rate shipping is for the lower 48 states only. Do you own the SSD-25RM? Please, tell us what you think about it. It helps us provide you with better products. Please note that it may take up to 72 hours for your review to appear.